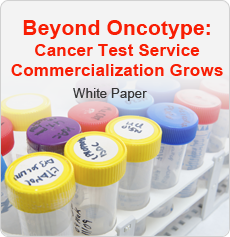 This white paper provides a look at commercialized testing services for cancer diagnostics. Many new cancer diagnostic tests that are being developed and offered today are highly complex assays, and it may not be easy to put the reagents for these tests into a kit for shipment to clinical laboratories. Because of this and other factors, many diagnostic companies have decided to commercialize their cancer tests by performing these tests in their own CLIA certified laboratories. Fill out the form to gain valuable information on the world market for cancer test services.